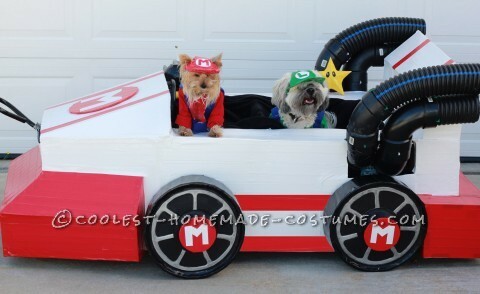 This awesome homemade costume for your dogs: Mario Kart Dogs took over 100 hours with 2 people but it was worth it! We used a pull wagon and built around it with cardboard and Styrofoam pieces. After cutting the correct shapes we used duct tape to put it together and to give it some color. For the wheels, we glued pizza trays on each end of a Tupperware bowl and then filled it in with Popsicle sticks. After that, we taped it black and also painted it using black and silver. We went to home depo to get some pipe which we put together with ties after drilling some holes. I made a couple characters such as the star and bomb by using duct tape as well. The dogs costumes are made out of felt and duct tape. If you have any questions let me know! We had a vision in out head and it was hard to figure out what to buy to use and how to keep the cost low but we had to spend a couple hundred in the end anyway so I hope it pays off… thank you!